Did you have a banana today? Or maybe an apple? Well, what did you do with the skin or core? Most people would have put their banana skin or apple core in the rubbish bin. But did you know that there’s a better way? It’s called composting. This means putting your food scraps in a pile or special bin so they decompose into fertiliser that you can use to feed your garden. What can you put in your compost? In addition to your banana skin and apple core, you can recycle every kind of fruit and vegetable, shredded paper, meat and bones, eggshells, vegetation, coffee and teabags. But you shouldn’t add too much meat because it can bring in maggots and make your compost smell. Things that shouldn’t go in the compost include plastic, milk cartons, coloured napkins and magazines, metal cans, glass jars, stickers, waxy party plates and dairy products. Good compost has the right balance of green (nitrogen-rich) and brown (carbon-rich) material. Try one green portion (such as horse poo, vegetable scraps and grass cuttings) to two brown portions (such as dead leaves, woodchips and straw). 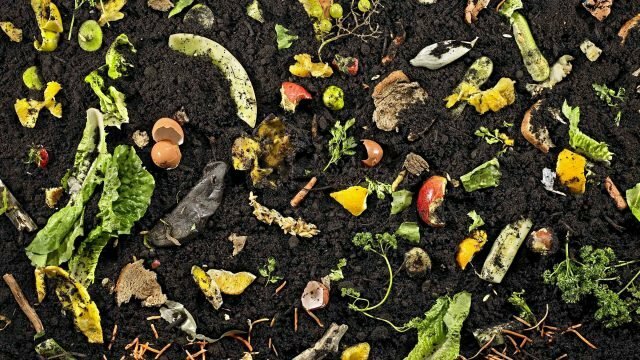 Over a period of time, zillions of microorganisms (such as bacteria and fungi) and animals like worms in the compost pile help break down the mixture of green and brown material into food for your garden. I think that this process is amazing. So by composting, you’re helping to save the planet. Doesn’t that feel good? Pick the kind of compost system that you would like, either an open pile or an enclosed bin. Regardless of what you choose, it should only be used for compost. Choose a place for your compost – somewhere outside that is flat, sunny and well drained, if possible. Put in the right things and in the right ratio – using layers of green and brown material – and wait. You’ll soon have a powerful fertiliser for your garden. At school, we have a composting program that I think is fantastic. Each class has a red bucket that is put out at recess and lunch and the students place their fruit and vegetable scraps into the buckets. Then we take the buckets up to our big compost bin and tip in all the scraps. When the compost is ready, the gardening club spreads the compost over their ever-growing vegetable patch. If you’re a kid and you’re reading this, you can make a difference at your school. Ask your teacher whether your class can start a composting program. You can even begin composting at your home, with your parents’ help. So now you know about composting, what are you going to do the next time you eat a banana or apple? If you don’t have a compost pile, start one. Encourage your family, school and council to go green. You can save the world, one fruit or vegetable scrap at a time!